My lack of recent writing activity (which reflects, alas, a lack of reading activity) is largely due to the wedding of the last of my children over the weekend, which entailed a trip to a villa on the Côte d’Azur and the subsequent take-over of the Oxo Tower terrace overlooking the Thames in London. Such are the arduous duties of fatherhood. One notable interaction with the natural world was that, after we had all partied at the villa until midnight (incidentally, two days of celebration and not a single glass broken – must be a record! ), but before we had all risen at 0630 to tidy the place up before leaving (in an incredibly disciplined manner – I’m most impressed by the younger generation!) a wild boar had found his way in and completely trashed the lawn on which the ceremony had taken place. Firstly that makes one very grateful he held off for 24 hours – I don’t think my daughter’s nerves would have withstood having her big moment take place in a ploughed field. But it also reminds one of the cost of reintroducing extinct species. 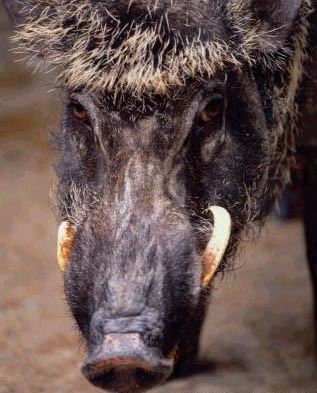 Wild boar, although common and even hunted in Provence, were persecuted to extinction in Britain by about the 13th century. There are now a few colonies of feral escapees in fashionable Sussex, and we saw a captive herd only last week on a visit to a local wildlife centre with our granddaughter. I knew they are big and mean enough animals to cause some threat to unwary trippers – the male’s tusks are significantly vicious – but hadn’t realised how the Englishman’s love of a perfect lawn would be threatened were we to restore the original balance of nature. We are used to crazy headlines here about deranged vicars firing shotguns at hapless moles to protect their turf, and even here at Garvey Towers we have had an occasional badger looking for grubs where he shouldn’t. But the lawn is a sacred English institution. How can Pimms No 1 and cucumber sandwiches flourish where there is a risk of marauding swine? The recovery of otter populations upsets only a few anglers. Re-introduce beavers (as seems to be happening here) and we’ll in all likelihood only improve our recent flooding issues. Bringing back wolves as a top predator would keep down the excess deer population at the cost of only a few lambs and unattended toddlers. But bringing back the boar and causing the Englishman to sleep uneasy about his garden – well, maybe that would prove an ecological rebalancing too far. Their meat, however, is very tasty. Ah, that tips it, Peter. Reintroduce the fellahs and get me a gun licence… the airgun I use for rabbits probably wouldn’t cut it.